How Should We Motivate Those We Lead? How should godly leaders motivate those they lead? The first king of Israel, Saul, provides a good case study. Saul, along with David, Samuel, and Jonathan are the main characters of the books of 1 and 2 Samuel. After reading through these two books, you might wonder why I chose Saul for a case study on leadership instead of Samuel or David. After all Saul is the inadequate leader the Lord rejects for David, who is the man after His own heart. I chose Saul not for his positive example, but for his negative. In other words, his actions show us how we shouldn’t lead. In 1 Samuel 17, Israel faces off against the Philistines. As they are set for battle, a man from the Philistine camp emerges who is 9 feet tall, decked in armor weighing 121 lbs, carrying a spear that is 15 lbs and as thick as the fat end of a baseball bat. Goliath is his name, and he is calling Israel to send a man to fight him in a winner take all match. Goliath’s challenge is met with fear, anxiety, and distress. Not a man in Israel is willing to fight Goliath. Knowing the hesitancy of his men, Saul does what any leader would do. He attempts to motivate a man to take up the challenge. How does he motivate his men? In 1 Samuel 17:25, Saul promises the man who defeats Goliath great riches, his daughter’s hand in marriage, and freedom from taxes. Essentially, Saul motivates his men with worldly possessions. Saul’s rewards were extended to all the men in Israel, not just a special group. Everyone in the army knows what Saul is offering, but none are willing to risk their lives against Goliath. Saul’s actions show exactly why he was rejected as the king over Israel. He doesn’t trust God, nor does he lead his people to trust God. Instead he attempts to exploit his people’s idolatrous hearts. Saul’s action are exactly the opposite of what a godly leader should do. Godly leaders don’t push their people toward idolatry. Godly leaders pull their people away from idolatry toward God. Why did Saul lead in this way? He didn’t trust God. He focused on the challenge in front of him instead of remembering the Lord’s promises and His past victories. Not only had God promised them the land, but He had defeated the Ammonites, Amalekites, and Philistines under Saul’s rule already. Instead of reflecting on these things, he allowed his fear to take over. When we don’t trust God and lead out of fear, we start planning and thinking in worldly terms. We leave God out of the picture, and we attempt to lead guided by our own fallen intellect, which is woefully inadequate. Turning within and leading our people by exploiting their idolatrous hearts is not the answer. Instead we must turn ourselves and our people to God. 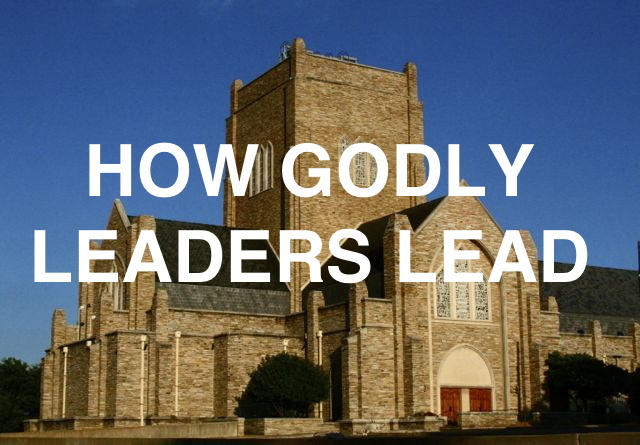 How do you lead? Do you turn your people to God, or to the world?